If necessary, the engine can be started by connecting it to the battery of another vehicle. If the engine should ever fail to start because of a discharged battery, the battery can be connected to the battery of another vehicle to start the engine. Suitable jump leads are required. Both batteries must be rated at 12 Volts. The capacity (Ah) of the booster battery should not be significantly lower than that of the discharged battery. The jump leads must be heavy enough to carry the starter current. Refer to the details given by the manufacturer. Only use jump leads with insulated battery clamps. • When it is discharged the battery can freeze at temperatures around 0°C. A frozen battery must first be thawed out before connecting the jump leads, as it could otherwise explode. • Please note the safety warnings referring to working in the engine compartment. • There must be no contact between the two vehicles as otherwise current could flow as soon as the positive terminals are connected. • The discharged battery must be properly connected to the vehicle's electrical system. • Switch off the car telephone if necessary. Details will be given in the manufacturer's instructions for the car telephone. The two jump leads must be connected in the correct sequence. 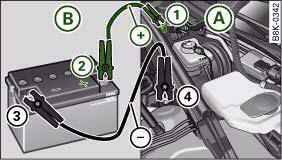 The jump-start terminals are located in the engine compartment ⇒ fig. 278. – Open the red cap on the positive terminal ⇒ fig. 278. 1. Connect one end of the lead to the jump-start terminal ⇒ fig. 279 1(terminal under red cap = “positive”) of the vehicle with the flat battery A. 2. Connect the other end of the positive lead to the positive terminal 2 of the boosting battery B. 3. Connect one end of the negative lead to the negative terminal 3 of the boosting battery B. 4. Connect the other end of the lead to the jump-start terminal 4(terminal with hexagon = “negative”) of the vehicle with the flat battery A. – Start the engine of the vehicle with the boosting battery B and let it run at idling speed. – Now start the engine of the vehicle with the discharged battery A. – If the engine fails to start: do not operate the starter for longer than 10 seconds. Wait for about 30 seconds and try again. – When the engine is running, disconnect the leads in exactly the opposite sequence to that described above. 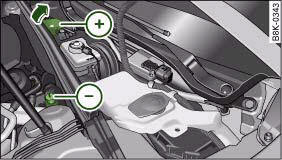 The battery is vented to the outside to prevent gases entering the vehicle's interior. Connect the battery clamps so they have good metal-to-metal contact with the respective terminals. • The non-insulated parts of the battery clamps must not be allowed to touch. The jump lead attached to the positive battery terminal must not touch metal parts of the vehicle: this can cause short circuiting. • Do not bend over the batteries – risk of acid burns. • The screw plugs on the battery cells must be screwed in firmly. • Keep sparks, flame and lighted cigarettes away from batteries: the gases given off can cause an explosion. • If jump-starting another vehicle, position the jump leads in such a way that they cannot come into contact with any moving parts in the engine compartment of the other vehicle. Please note that the above method of connecting the leads is meant for jump-starting your vehicle. If jump-starting another vehicle, you should not connect the negative lead (–) to the negative terminal of the discharged battery, but directly to the engine block or a solid metal part bolted to the engine block. If the battery of the other vehicle does not have a gas vent, there is a risk that a mixture of oxygen and hydrogen gas can accumulate and cause an explosion.